Termites, or white ants as these insects are more commonly known, are social insects living in groups ranging from a few individuals to colonies of more than a million. Depending on the species, these colonies live within a wide range of structures varying from group nests (mounds) and large bulbous tree nests, to the hearts of live trees, in the ground under small pieces of wood and even within houses in the inner city. Interestingly, one species, blown by the wind, has even been found to form colonies in the wood of buoys in the middle of Sydney Harbour. Although it is possible to collect termites from all types of nests, in many instances it is a most unrewarding task if the colony size is small and the individuals are spread thinly through a large volume of soil, or within a large city terrace. 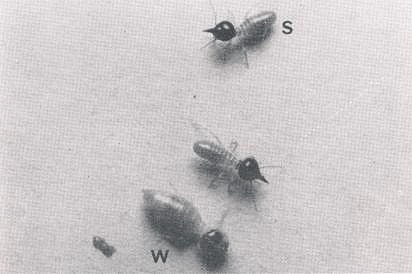 Thus there are two factors affecting the choice of a termite colony for harvesting; size and access to the nest. In the Sydney region there are only four species of termites which form nests large enough to be worth harvesting. However, in terms of accessibility and ease of collection only the two mound building species, Coptotermes lacteus and Nasutitermes exitiosus offer the best prospect for large scale collection. The other two species which can be called tree termites are a more difficult proposition, but since they are still quite commonly found their collection will also be dealt with. Appendix 1 is a guide to the identification of genus Coptotermes and Nasutitermes. Plate 1 shows a Nasutitermes species and Plate 2 a Coptotermes species. C. acinaciformis is a very hard termite to find in large numbers in the Sydney area because, although it is the species most frequently found attacking houses in the city, it usually does this from nests buried deep in the trunks of tall trees which are all but inaccessible unless the tree is felled and split. However, it can be collected quite easily if some infested wood is taken from a house or a garden and held over a plastic tray and banged vigorously with a hammer. Quantities of termites up to about 5,000 (5-10g) can be collected in this manner and may be kept alive and active for a short period (2-6 hours) in the tray if it is placed out of direct sunlight and covered with a dampened towel. Unless an entire nest can be cut from a tree however, it is difficult to keep this species alive for long periods and thus they should be either used immediately or deep frozen (-20oC). In contrast N. walkerii, the other species which is difficult to collect in large quantities, is at least very visible since it forms the bulging dark coloured tree nests (see Plate 3). Although these are obvious and often within reach of the ground, unless the nest can be cut from the tree very quickly the termites will escape into the trunk. The best method then to remove these nests is to rapidly cut off the entire branch supporting the colony and saw it into pieces on a large plastic sheet on the ground. This enables the collector to catch any termites that fall from the piece of wood. If the nest is attached to the trunk of the tree it should be chopped off very quickly with an axe. As with ground nests (see below) the collection of tree nests should be done in the early morning. Unlike C. acinaciformis, N. walkerii may be kept for short periods in plastic garbage bins. 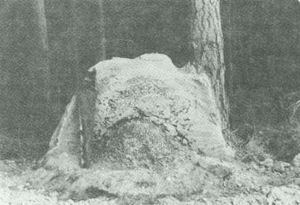 This technique is similar to that described later for maintaining ground nests with the exception that a thin layer (2-3cm) of earth from the area where the tree nest was found is placed in the bin, and the nest and pieces of dead wood from the tree are placed on top of this. Care should be taken not to include any ravenous ants in the soil or wood! Small numbers (5-100g) of these termites can be extracted from the artificial nests by removing the pieces of wood and tapping them with a hammer. When all the insects are required, firstly tap them from the surrounding wood, and then break up the nest and treat it in the same way as a ground nest. Undoubtedly the best and easiest way to collect termites is to do so from ground nests or mounds. Both the mound building species of the Sydney region C. lacteus and N. exitiosus form large nests of about one million insects, and thus can provide a good source of live food. N. exitiosus is the easier insect to collect and will always give larger harvests than C. lacteus because the mounds are smaller, softer and easier to dig, and more manageable in that they are not built against trees. A normal mound of both these species varies in height but is composed of three different parts; the hard outer protective wall from 10-30cm thick, made up of a clay/earth material and containing few galleries or chambers; the inner region forming the bulk of the nest and resembling a honeycomb with its innumerable galleries composed of a tough wood material; and a central nursery, usually at about ground level made of a more fragile wood material. The nursery, where the Queen, eggs and young are principally found, has a different gallery construction to the inner region which allows it to be really identified (Plates 4 and 5). The last two parts contain most of the termites. Prompt removal is essential if the Queen and the bulk of the colony is required. Although both ground termites have apparently similar mounds, there are a number of differences which, with practice, will allow a collector to recognise the termite genus from the nest construction. In the Sydney basin, as a rough rule of thumb N. exitiosus is usually found close to Sydney and the coast, whereas C. lacteus tends to be more common towards Windsor and especially the Blue Mountains. The mounds of N. exitiosus near the coast in the sandy low rainfall hilly areas (e.g. Ku-ring-gai) are low, 20-40cm and thin skinned, but smooth and dome shaped with most of the nest underground. In the more densely forested country (e.g. Lithgow, Bell, etc.) their mounds are taller, perhaps up to 60-90cm high but still have a relatively thin outer wall, 7-10cm. C. lacteus on the other hand, builds taller (100-300cm) thicker walled (20-60cm) non-conical nests whose surface has a lobed and gnarled appearance. The thickness of the outer wall increases in the colder climates like the Blue Mountains. Generally speaking because of the toughness of the outer wall, and the larger size of the mound, and often its proximity to a tree, it takes longer to dig up a nest of this species, which means that fewer termites will be caught. The average population of a viable mound is probably 1.0 million insects. However, occasionally if the mound has been damaged in the past the numbers may be much lower. To check this, the "vigour" of the number of insects in the mound can be roughly assessed by its temperature. Once it is opened, a healthy nest should have a temperature above 20oC and be very humid (above 90% relative humidity). Care should be taken when collecting mounds too close to main roads or in pine forests. The former because the nests have often been levelled, and then the small visible mound is probably sitting on a much larger diameter underground nest which will allow the termites to escape. Nests in pine forests are poisoned and are usually dead. To collect a ground nest one needs a shovel, mattock, and at least four plastic garbage bins. It is advisable to begin early in the morning, as the fall in temperature at night causes the termites to congregate in the mound. Ideally a 15cm trench is dug around the nest about 24 hours before harvesting. This causes the termites foraging outside the mound to return to protect the queen and nursery. However, if time is not available this step can be carried out on the morning of collection. To successfully remove the termites perform all the operations as quickly as possible. Strike the top of the mound with the mattock, burying it well into the outer wall and wrench off half of this outer covering and quickly repeat with the other side and any remaining pieces. This is necessary since the nest will be too heavy otherwise. A second person could clear the pieces from the immediate area. Next bury the shovel and/or crowbar into the trench deep underneath the nest and carefully lever it out of the ground, place it on a sheet of plastic and break it into pieces and put these into plastic garbage bins. After the bins are loaded place some dry wood from the area of the nest into the top of the bins and cover the wood and nest material with a damp towel. These "artificial" nests may be kept like this for about 3-12 months by ensuring that the towels are kept damp and by occasionally adding some more wood. It is necessary to be cautious with these nests, since C. lacteus may eat through the plastic bin within 12 hours and perforate car seats if the bins are not placed onto a hard surface such as concrete or galvanised iron. If the termites do escape they are foraging for food and are not dangerous and will not form a new nest elsewhere. Although this technique will allow aviculturists to maintain nests at home, if mounds are located it may be more convenient to periodically harvest them in situ, rather than remove them. The best way to accomplish this and to ensure that the remaining termites survive and rebuild the nest is to use the mattock to remove only a section of the outer covering large enough for a shovel to be inserted. The nursery should be avoided, but up to 50% of the tough woody honeycomb material can be taken. The hole in the nest should then be sealed to aid the termites to recover and to prevent the entry of ants and birds. The termites in the honeycomb material can be maintained like an ordinary ground nest in a plastic garbage bin or separated for immediate use. When the live insects are required, there are two ways to separate them from the nest material in the bins. The simplest way is to take a piece of wood from the top of the nest, hold it over a large tray and tap the termites off it. This gives a clean preparation of small numbers of live insects. To extract large quantities of live termites, the nest material in the bins should be taken and tapped to dislodge the termites. To remove the remaining insects the material is broken into small pieces, about one centimetre in size, preferably over mesh sieves. The sieves are jarred from time to time so that fine debris and termites pass through. The mixture of sieved or broken material is then evenly distributed over large photographic trays or similar containers. When a tray has been filled to a depth of once centimetre, light cardboard sheets (e.g. from shirt boxes) are laid to cover the surface. The termites will quickly crawl under these pieces of cardboard and cling to them to avoid the light. The sheets should then be removed and the termites tapped from them onto perspex platforms supported above small plastic trays by glass tumblers (see Plate 6). Live, uninjured termites, in attempting to escape from the light, will tumble over the edge of the platform into the tray below, leaving behind damaged and sluggish individuals. To speed up this process the temperature of the room can be raised, and the trays of debris jarred or stirred occasionally. Using this process it is possible to separate up to one million termites - about one kilogram of termites in a day. However, it is possible to avoid some of these steps if the initial separation is done carefully. For example, if the nest material is banged lightly with a hammer the termites will drop off it, and provided not too much nest material drops amongst them, it may be convenient to feed this mixture directly to the birds. However, it is probably best to then place this mixture onto drop trays (that is onto the glass platforms suspended over photographic trays) to obtain termites free from nest material. Whereas there is really only one sure method to take a termite nest from the ground, there are, as mentioned, a number of ways of separating the termites from it. Ultimately the choice of method will depend on individual preference and experience so that techniques described here should be considered as guides, not set and fast rules. Basic guide to the identification of the general Nasutitermes and Coptotermes. It is relatively easy to distinguish between these two genera, but not between the species. 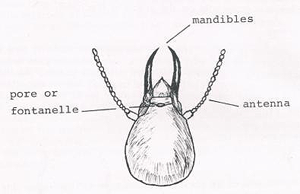 The identification is based on the shape of the soldier and especially on the shape of the head. 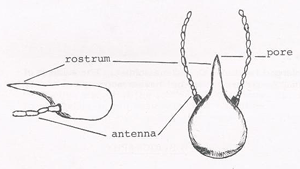 The soldier is smaller than the worker (see Plate 1) and has a chestnut brown head drawn out into a long rostrum (see below) and only rudimentary mandibles which are difficult to see. At the end of the rostrum is a pore invisible to the unaided human eye, through which the soldiers can shoot a clear sticky yet of liquid with a distinctive odour of lemon and eucalyptus. Figure 1. Enlarged head of a N. exitiosus soldier. The soldier and worker are similar in size (see Plate 2). The soldier has distinct black, long, narrow, sabre shaped mandibles and a yellowish-brown head. On the head almost between the mandibles is a small pore (the fontanelle) from which the termite can excrete a sticky white odourless defence substance. GAY, F.J., GREAVES, T., HOLDAWAY, F.G. Standard Laboratory Colonies of Termites for Evaluating the Resistance of Timber, Timber Preservatives and Other Materials to Termite Attack. C.S.I.R.O. Aust. Bull. 277, 1955. KRISHNA, K., WEESNER, G.M. Biology of Termites Vol. 1 (1969), Vol. 2 (1970), Academic Press, New York. Plate 1. A Nsutitermes sp. worker (w) and soldiers (s). The soldiers are smaller than the workers and are more numerous than in C. lacteus nests. The soldier has a dark brown head with the typical "point" on it. This point is in fact a fine mini cannon which squirts a defensive secretion at ants and other nest enemies. Plate 2. A Coptotermes sp. soldier (left photograph) and worker (right). Termite species are generally recognised by the distinctive shapes of the soldiers. Coptotermes sp. soldiers have a yellow/brown head with dark mandibles. Plate 3. 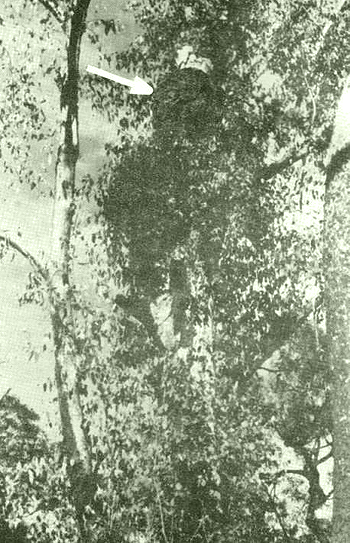 Tree nest of Nasutitermes walkerii attached to the trunk of a Eucalypt sp. Numerous galleries would run down both the outside and inside the tree to the earth below. Plate 4. 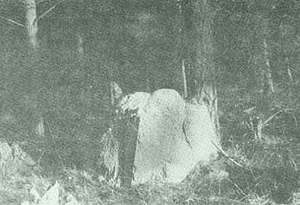 Typical mound of Coptotermes lacteus positioned against a pine tree near Lithgow, NSW. The nest is lobed and asymmetric unlike the smaller, conical mounds of Nasutitermes exitiosus. Plate 5. The mound of Coptotermes lacteus shown in Plate 4 sectioned to show the internal structure. The thick tough clay outer wall and dense but fragile inner spherical nursery are obvious. Between these lies a usually easily distinguishable mass of "carton" material pierced by innumerable galleries. Some of this gallery formation is visible directly above the nursery. Plate 6. 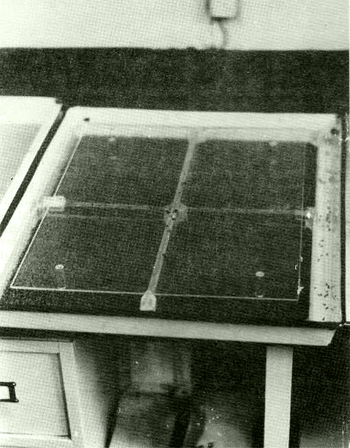 The "drop tray" procedure developed by CSIRO for separating live termites from nest material. The insects and nest pieces are placed on glass sheets suspended over plastic trays. Live termites walk off the edge of the glass and drop into the tray below.